Katie Morell caught the travel bug during the last week of her sophomore year in college when she and her boyfriend decided—on a whim—to backpack through Europe. Landing in Paris 10 days later, she was immediately taken by the foreign sights, smells, sounds and experiences and committed herself to a life of travel. After graduating with a journalism degree, Katie worked as an editor at a travel magazine, but when that wasn’t enough, she decided to quit her job and spend the next 12 months travelling through Asia, Australia and New Zealand. She came back in 2009 and started freelance writing full-time. Today she is based in San Francisco and her work focuses on travel and business topics. While on assignment, Katie has teetered on the edge of a 1,109-foot building in Macau, fished for piranha in the Peruvian Amazon and dined with award-winning chefs in Spain. Her work has appeared in Hemispheres, USA Today, Chicago Tribune, The Writer, Consumers Digest and others. Find out more at www.katiemorell.com. What do you love most about traveling for a living? I find it incredibly rewarding to see how other cultures live, work, play and communicate. When I’m on assignment in another city—be it 20 miles away or 2,000 miles away—I try to spend at least an hour a day just roaming the streets. It is on these walks that I usually get my best story ideas and meet the most interesting subjects. What's the one comfort from home that you pack on the road? I wish I could say something cool like a pet rock from my childhood or a handkerchief passed down from a great-grandmother who survived the sinking of the Titanic, but, honestly, I’m pretty practical. I’m lost without three things: My credit card, my passport and my smart phone. I keep digital copies of the first two in my email in the rare case that I get robbed. And even if I am going to place where my smart phone won’t work, I still bring it just to look at pictures of my husband and beagle, Lucy. Those pictures help when I get homesick. What places that you haven't been to yet remain on your travel bucket list? Morocco! I’ve always been intrigued by the colors, spices, textiles and vast diversity of landscape in that country. Outside of Morocco, I’d love to visit Argentina, Patagonia and Bolivia for the trekking, festivals, sunsets and wineries. Oh, and Moab, Utah. Yes, a little random, but I’ve always wanted to use Moab as a jumping off point for spending a two-week camping trip exploring Arches National Park, Canyonlands and Zion. Tell us one of the crazy/scariest/most awe-inspiring/funnie​st story from your travels. Back in 2008, I was traveling through northern China by bus with my husband and a friend. The Olympics were only a month away and, unbeknownst to us, there was a national crackdown on border crossings. After a 12-hour bus ride through the Inner Mongolian desert, our driver stopped at a small hut on the side of the road and two men with AK-47s got on, pointed at me and my travel buddies (all Americans) and yelled at us to get off. Unscathed and bewildered, we only had to wait a few hours before finding a ride to the nearest town. What’s your most valuable tip when trying to blend in as a local? Know how to say “Hello,” “Please” and “Thank you” in a country’s native language before stepping off the plane. You really don’t need to know “Yes” and “No” (although I’m sure you will learn that quickly, too) because both can be conveyed with body signals. The former three phrases are essential to everyday communication and will make you not only look polite but also like you’ve done some language homework before arriving—which can help you endear yourself to locals wherever you go. 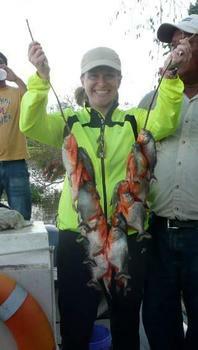 Photo of the writer in the Peruvian Amazon, triumphant after catching piranha. Courtesy Katie Morell.